I took video footage of the two issues I currently have with my Grizzly 7x12 mini-lathe that I got last monday. This is my first lathe ever. 2nd part of the video shows that I'm having problems facing off the work piece. The cutting tool ends up tapering the work piece and doesn't stay square. I've tried different cutting tools, different angles, different work pieces. I've been cutting off .005 to .030. It all ends up the same. with a rounded end of the workpiece. - rotate the tool post a few degrees or so counter clockwise so that you only cut with the tip and not the side of the triangular insert. Some holders actually present the insert at an angle not parallel with the holder which helps with that, but others don't and you end up dragging on the side of the insert through the cut. The tool post does not have to be oriented exactly 90 degrees to the lathe bed. - lock your carriage. Not sure if your machine has a carriage lock but here is where it is useful. The tool pressure can cause the carriage to move away from the work as you go through the cut giving a not-square end. If no carriage lock, holding the carriage handwheel with your left hand so it can't move works too. You are ambidextrous, aren't you? -your centre height on the tool looks ok from here but I can't tell for sure. You've got a bit of nib there which isn't optimum but it also suggests you're not miles out either. Those are just a couple things I saw right off the bat, you'll get some more feedback from others soon. I gotta get back to work. Well, the indicator dial should have a setscrew, mine is located pretty close to the zero. That is to allow you to loosen the dial and turn it to zero from any position. I suspect that yours is loose. This is not the nut that holds the handle on. If that is the one you have tried without success, I suspect that the hole may not have been tapped to the bottom, and so the setscrew is not gripping the shaft. If so, you could thread it deeper, or just put a bit of brass under the setscrew, and let that grip the shaft. As to your facing, it might be that you have too little angle on the tool, or that the toolholder is not tight on the compound. The former will make cutting very difficult, the latter will allow the cutting edge to rotate slightly, dishing or doming the surface. 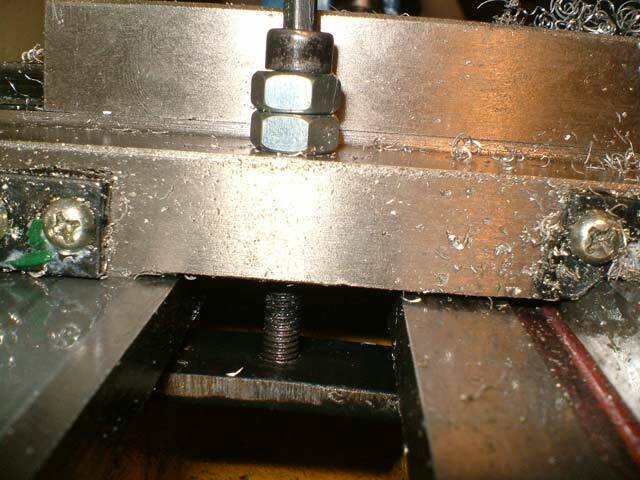 As to the threading indicator, that is on a single bolt that will allow you to pivot it off the leadscrew to reduce wear, you simply need to pivot it back to contact with the leadscrew and tighten the bolt. It will not rotate when the leadscrew is engaged, for power feeding, just when the feed handle is not engaged. At that point it will rotate, either by turning on the lathe, or by using the handwheel. Hope this helps. What material are you cutting and what speed are you running at? Sounds fast to me. I'm cutting mild steel and I've already tried different angles and different speeds, as well as different cutting tools and cutting off small from .005 all the way up to .030. It's good to practice on cutting aluminum first to get familiar with the basic operations. Steel is harder to work and everything is tougher and takes longer since on a light lathe you have to take lighter cuts. There is a half circle spring on the feed screw that fits in the dial (#190) and provides friction to turn the dial with the feed screw but allows you to turn the dial to zero it. This spring may be missing or collapsed. You may need to bend it for more spring tension on the dial. I ordered a half dozen from LMS since my big hands tend to lose small parts. I have 2 of those springs on my feed screw for more friction. Turn the tool post so only the tip of the tool can cut on the face. It looks like the whole side of the insert is cutting and causing a taper. I think I have a problem with the carriage moving while I'm facing. I don't have a carriage lock and I pretty much need a mill to make one... I'll figure something out. Yeah, i saw that half moon spring #190 on the diagram. I had a tough time trying to get #87 on because of it. I tried different angles and cutting tools to do facing, but they all do the same, even with the very tip of the carbide hitting the face and nothing else. LMS carriage lock is worth the money in my book. Works perfectly on my G8688. I would have just made one if had a mill when I bought the lathe but did not. Tweek the spring in the collar a little. Had to do the same on mine. Also, make sure there is no oil/lube in that area where the spring is located. To find out if the carriage is your problem put the back gears in neutral so the lead screw won't turn and lock the half nut. This way you are using the lead screw as a carriage lock. Not the best lock but it should be good enough to get a straight cut. That's what I did before I got the carriage lock from LMS. Also you may need to adjust the carriage gibs a bit tighter. You don't need a mill to make a carriage lock. You could duplicate the LMS lock by welding flat bar and drilling for a center bolt and nut. Don't get discouraged. We all have gone through this kind of stuff with our mini lathes and mills. It is kind of fun to debug these kits and you learn a lot from all the little problems that you discover. Before long you'll have that lathe running like a dream. Referring to Terry's photo, take note of the HSS cutter in the toolpost. You'll find that HSS is generally sharper than carbide, when properly sharpened. It's easy to learn to sharpen lathe tools - plenty of videos on line. Quite a few of us recommend starting with HSS tooling when you're learning. If you're going to use Roy's suggestion of using the leadscrew as a carriage lock, have the compound (upper) feed set to 0 degrees so that you can feed in between cuts with out having to turn the feedscrew by hand. I can't tell from the video, but have you checked the tool height? It needs to be right on the centre-line of the spindle. As far as cutting speeds go, this is the single biggest factor for new operators getting good or bad results. We were all there at one point. The attached file is a set of charts that I made up when I learned about cutting speeds. It was for a different lathe, but most of it, other than the last one, should help you. It helps to have an optical tachometer to check the actual speed. On those tiny machines it doesn't take much to have issues. On the facing issue. The saddle might be convex and as it cuts it rocks back and forth like Grannies rocking chair. Take a mag base and put a thin sheet of paper (used to protect the ways from getting scratched) and set it under the mag base. Then reach out and put your .0005" or .001" indicator on the operators side of the saddle as close to the chuck side. Then with your thumbs only put one on the same side as the indicator and one as far to the right and press and release each thump pressing say with 10 psi and see if the saddle rocks on the bed. I have seen this several times on lathes that are Asian or worn. many times they are never scraped correctly and the leave the middle high on the bottom of the saddle. And no matter what you do you get movement. The carriage lock is designed to mount in 2 existing tapped holes for mounting the steady rest. Everything on a mini lathe is in an awkward position. Thanks. Yeah, I admit I'm getting a little discouraged since I bough this lathe, but hopefully I get all this figured out. Most machine have a woodruff key on handle to feed screw. That uses a friction fit it seems. Either the shoulder on the feed screw is to long or you didn't tighten it tight enough. I would also turn my compound more so your riding on the top more. I would also try a HSS toolbit as sometimes the geometry on inserts and bad geometry on mini lathes are not the same. .
You may see if you can track down a mentor or say school instructor who lives near you to help you. Call around to some local machine shops and see if they have a retired lathe operator who you could call and see if he can help you. Keep at it - you'll get there. The mini lathes do come with their limitations but then their price and compact size make machining accessible to those who don't have the money or the space for larger machines. I had mine for about two years and there was a steep learning curve. But after a while you adapt to your machine and can create some fantastic parts with it! You will probably also find that when you do move onto a bigger machine you have a much better understanding of how the thing works which makes troubleshooting much easier. I think the general rule of machining is that no matter what size of machine you buy you always want bigger! The first few weeks of owning my 13 x 30 lathe I thought it was the best thing ever but soon I realised that given the machines increased rigidity I can take much deeper cuts. This led me to realise that the machine is under powered to take said cuts! Oh well, I had best start saving for a more powerful motor! I suspect the facing issue is due to the carriage moving back under the force of cutting. As you cut the work piece there will be a force pushing back against the tool. Without a carriage lock this force will push the carriage back slightly (i.e. moving the tool away from the workpiece) which will be giving you a convex face. As has been mentioned before, try disconnecting the feed screw gears and engage the half nuts. This will prevent the carriage from moving back. It's not perfect but it'll be a huge improvement on what you're doing currently. Alternatively you can make a very primitive carriage lock as shown here: http://www.mini-lathe.org.uk/images/lathe_carriage_lock_3.jpg It looks to be a piece of flat bar that's been cut to the appropriate length and drilled and tapped to accept an M5 screw so you could knock something like this up with very little effort assuming you have some scrap flat bar lying around. Have a look at your machine. On mine there is a drilled hole on the tailstock end of the carriage which is designed for the carriage lock. This makes it a bit more accessible than one at the headstock end. 2nd part of the video shows that I'm having problems facing off the work piece. You seem to be using the side of the tool to do facing--this is wrong. a) make sure the tip of the cutting tool is dead on center of the spindle. b) angle the tool towards the facing cut so that only the tip of the tool does any cutting. Single point tools (lathe, shaper) work well because large forces on very small area creates enough pressure to rip the metallic structure. A little insight from a "casual" user, if I may. I'm not in this for regular use, just to make a piece when I need it. I have a "big" (12x36 Craftsman) machine now, but have worked with small machines from the UniMat DB-200 up. And Pop's hand drill in a vise when I needed but had no lathe. Rough but do-able ........ I do have a slightly smaller machine to do metric threading when needed. But the mini (6x12) was passed on to a maker's group a few years back when I got my hands on the Craftsman. For the saddle clamp, I found a bolt that adjusted the tightness of the saddle and replaced it with a cap-screw and wrench. That stays on the machine. On the right near side on mine. I dont know if it has a gib or just adjusts. It does stop the saddle. I use it regularly for facing cuts, and especially cutting off. For the cross-slide, well it's an old machine and the dovetails are badly worn. I replaced one of the gib screws with a longer screw and a home-made knob. The knob was soft plastic, easy enough to find these days and the screw heated until it could be forced in. When it cooled, voila, an adjustable set screw. I can run the cross-slide in (or out) with one finger and then tighten the gib for the last couple of turns. It ain't perfect but does get by worn dovetails. And I can cut a half-thou when I need to. Just have to ease into it with the last couple of cuts light. And use a reading glass so I can see the dial. There's one on the compound too, but doesn't get used much. There is always some part larger than you can chuck up. Even when you have access to a shipyard lathe. The art is to figure out a way to get around it. To make it work anyway. I truely hope this will be of assistance. It's definitely the carriage moving around. I just saw it move.. when I was doing a face cut and a tad bit aggressive turning. I was holding the carriage handwheel to prevent it from moving and I managed to do face the part I was working on, but I can't hold the wheel steady enough, so it's not entirely flat. Not to mention, the hot chips were hitting my hand which I didn't like. I ordered the LMS carriage lock that was posted here. The fact that the lever is on the chuck side is kind of off putting, though. There is room to make the carriage lock work on the back of the carriage if you want to put it there. Drill and tap a couple of holes or just let it sit on the carriage. Would have to remove it to adjust the gibs but that's not a deal breaker. I replaced the lever with a socket head cap screw since the lever got in the way many times. Easier to use a hex key to lock/unlock the carriage. That is a great idea Roy. I'll be doing this to mine in the morning. I used the lever for the LMS carriage stop. A small shim washer between the two half's of the stop body and the lever make it a quick adjustment stop. This is a great thread. Thanks to all of the participants. Do all mini lathes have have manual lever operated carriage stops? Are there ones that don't move at all when you're facing or turning? My tailstock is annoying, too. I have a bolt you gotta tighten to lock it in place. A lot of the other lathes I see have a locking lever. Is there a replacement tailstock that I can put in that has a lever and that will center with the chuck?